We tend to think of a trial as a single event, but in reality, it is a multi-stage process. The pretrial procedures begin with arrest and booking and extend through to the defendant’s first appearance and bond hearing. The result of the bond hearing determines whether a defendant may be released on bond until trial, or whether he or she must spend that term in jail. Here we’ll walk you through the basic steps of the pretrial process, with special emphasis on the bond hearing. If you are arrested, say in Cobb County, you are typically transported to the local police station for booking—a process where you are photographed, fingerprinted, and your name and the nature of the crime formally entered into the records. The arrestee surrenders any property they may in their possession at the time of arrest (cash, car keys, cell phone, etc. ), and these items are also logged-in and stored. These will be returned upon your release. The initial court appearance is an essential part of due process, and its main aim is to inform the defendant of the state’s charges against him or her. There are strict time limits governing the promptness of this hearing. Here’s how it works in Georgia—if the arrest was made based on a warrant, the defendant must receive an initial court appearance before a magistrate judge within 72 hours of the time of arrest. If the arrest was made without a warrant, that time decreases to 48 hours. These limits are in place to discourage the state, county, or any municipality from letting arrestees languish in jail without being informed of the charges against them. During the initial appearance, it is also determined whether the defendant has or can afford an attorney. Those who cannot afford an attorney (termed “indigent”) are assigned a public defender to handle the person’s case. While as a defendant you may waive your right to counsel at this time, it is strongly discouraged, as an attorney is your best advocate in navigating the often-complex criminal justice system. Once a defendant has secured an attorney, that lawyer will handle all subsequent phases of the defense. The initial hearing is also the time when bail is set. 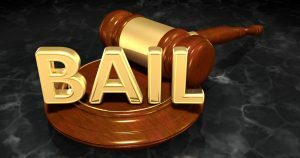 The nature and amount of the bail are determined by several factors—including the nature and severity of the crime, the defendant’s standing in the community, and the potential that they will flee (“skip bail”) and not appear at trial. Those accused of more minor offenses and those considered to pose a low flight risk are more likely to be granted bail (in Georgia non-felony hearings are handled by a magistrate, felony hearings by a judge). For capital crimes (such as murder or armed robbery) bail is generally denied and the defendant must await trial in jail. There are several types of bond that a judge may set. The most lenient of these is called an “OR” (own recognizance) or “SOB” (signature bond). In such cases the defendant promises to make all subsequent court appearances but is not required to surrender any cash or property as collateral. This is generally reserved for those who are accused of less severe offenses. Another type of bond is the “surety bond”—in which a third party (the “surety agent, a.k.a bail bondsman) posts the bail amount on the defendant’s behalf. In return, the defendant pays a fee of typically between 10% and 15% of the total bond amount. Once bail is posted, the person is released pending trial. The fee paid to the bondsman is non-refundable and goes toward covering the bonding company’s expenses. Bond needn’t always be made in cash. In the case of a “property bond,” the defendant or a friend or family member can put up property (typically jewelry or a vehicle) as collateral to assure the defendant’s appearance at all future court dates. In some cases, the court may request that an “all cash” bond be posted, and this money is returned when the defendant completes all scheduled court appearances. If bond is granted by any of these means, the defendant remains free pending trial. Remember that all forms of bond are, in essence, a promise and that defaulting on that promise by failing to make any scheduled court appearances can result in default on that promise and loss of any collateral. We hope this brief review clarifies the dynamics of the bond hearing and makes the process easier to understand and navigate. Should you ever find you or a family member in need of a bail bondsman, please call Bond James Bond, Inc. We have 11 locations that are open 24 hours a day, 7 days a week to serve you quickly.